IF YOU WOULD LIKE TO GET A QUOTE FOR THE STATE OF INDIANA OR KENTUCKY PLEASE CALL THE AGENCY AT 513-598-6600 MONDAY-FRIDAY 10AM-6PM AND SATURDAY 10AM-2PM. THE ONLINE QUOTING ONLY WORKS FOR OHIO. 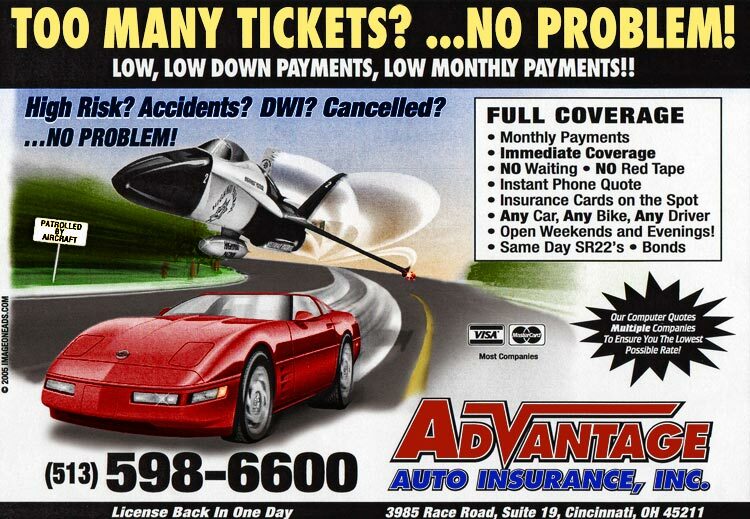 Advantage Auto Insurance, Inc. specializes in auto insurance, sr22, bond, and high risk car insurance in Cincinnati, Covington, Newport, Norwood, Blue Ash, Finneytown, Bridgetown North, Florence, Taylor Mill, Northbrook, Harrison, Forest Park, Loveland and the surrounding areas in Ohio. Quickly and easily submit your application for a free automobile insurance quote using our easy to use website. Advantage Auto Insurance shops insurance carriers to find the best auto insurance rates for you.